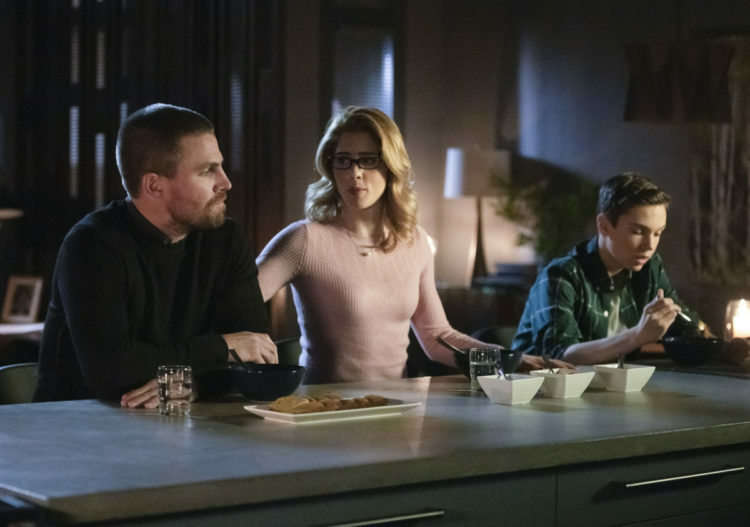 Arrow Season 7 Episode 13 Review: "Star City Slayer"
After the frustrations I felt during Arrow‘s 150th episode last week, I needed an hour like “Star City Slayer” to remind why I love this show, even when it’s at its most maddening. Unlike Diggle’s proclamation that everyone had each other’s backs, this week’s emotional payoffs actually feel earned. The action sequences aren’t about tracking down a vigilante-obsessed wacko whose motivations seem convoluted at best; instead, they’re tied to a villain whose creation we saw earlier this season during the Slabside arc, or they’re used to reveal the identities of some major characters in the flash-forwards. And while the “twist” at the end of “Star City Slayer” is something that many fans predicted months ago, it’s still a welcome development for not only how it connects major present-day characters to the new faces in the flash-forwards but for the emotionally compelling story it hints at, the story that takes place in the two-plus decades between the two separate storylines, a story that I hope we get to see a lot more of throughout the remainder of this season. And what is this story exactly? I don’t know why I’m writing around it so much. If you watched the episode, you know the major reveal: Blackstar’s true identity is Mia Smoak, and she is the daughter of Felicity Smoak and Oliver Queen. Again, as I mentioned above, this reveal is something that many fans have speculated about and accurately predicted for months, but that doesn’t stop it from being great, not only because of what it sets up for Oliver and Felicity in the present (How will the two of them deal with Felicity’s pregnancy after having just sent their son away to live a normal, safe life?) but because it injects the flash-forwards with a new sense of urgency that they desperately needed. No longer is this future storyline simply about an “abandoned” William halfheartedly trying to figure out what new disaster is coming for Star City; instead, it’s about two Queen siblings who have never met, who apparently didn’t even know the other existed, working together to not just save the city but create a stronger between themselves as well and, hopefully, find their parents in the process. If that sounds a lot like Oliver and Emiko’s storyline in the present day, you’re not wrong, and I don’t think it’s an accident. However, while Emiko’s origin is still a little bit of a mystery (Did she decide to don the Green Arrow costume after learning that it was her half-brother under the hood? How did she become so skilled at fighting? Was it just from growing up in the Glades, or is there more to her training than we realize? ), it’s clear to see that Mia learned both physical and technological skills from her parents. Many of her fighting moves mirror Oliver’s, and while I would bet my money on William winning a hacking competition between the two siblings, Mia still seems to know her way around a computer, which is why she spends so much of this episode trying to obtain the Archer access codes. But more interesting than the pair’s individual skill sets are the two different ways that they likely grew up, especially given that William is sent back to Central City this week to live with his grandparents after Stanley emerges as the titular Star City Slayer, almost killing Dinah and paralyzing Oliver, Felicity, and William with a drug as he contemplates whether or not he wants to protect or murder them. I can understand people being frustrated with this development with William, asking why Samantha had to die if he was just going to end up living in Central City anyway. However, without Oliver and Felicity caring for him these past two seasons, they wouldn’t understand how prepared they are for what’s soon to be coming with Mia, and moments, such as Oliver’s promise to his son that he’ll “always be your dad” and that he will “have a home in Star City with us forever,” would not have been earned. Without all this onscreen time with Oliver, Felicity, and William, these scenes would have felt as fake and cheap as Diggle’s assertions from last week. It was important for both Oliver and Felicity to spend this time with William because, in its later seasons, Arrow has shifted from a show about Oliver Queen’s journey to a series about his legacy. The question is no longer about whether or not he’ll save Star City or how he’ll take down the latest season’s big bad (although let’s get one thing straight: Stan is more intimidating in one episode than Diaz has ever been). Arrow is now about what Oliver will leave behind when he hangs up the hood and bow and arrow for good, what he’ll have left when his identity transforms from the Green Arrow to simply that of husband and father. Oliver Queen will never stop being a hero, even when his days fighting for Star City are done, and from what we’ve seen throughout the flash-forwards as of right now, his children will never stop trying to be heroes either, even when everything else is telling them to run away and do the opposite. That’s what Oliver Queen’s legacy is: the heroic spirit of both William and Mia. And that’s not something they inherited through blood—it’s something they learned from the example of his and Felicity’s actions. Whether they were in the same home, same city, hell, same world as their parents, both William and Mia know what Oliver and Felicity have done to protect Star City and all the people they care about most. The two of them emulate that, whether it’s fighting with a knife or hacking into a building, and by doing so, they guarantee that, no matter what Oliver and Felicity’s fates in the future are, their parents live forever. That’s one hell of a legacy, isn’t it? While I haven’t enjoyed the character of Curtis for quite some time, I always respected Echo Kellum’s abilities as an actor and found him to be an incredibly kind and down-to-earth guy when I met him at SDCC last year. Plus, his motivation for leaving Arrow, which is to focus more on being the best father he can be to his kids, is pretty damn wonderful. I wish him and his family nothing but the best. I also want to comment on some of the negative reactions I have seen to Felicity’s pregnancy from members of the Arrow fandom, including some people who call themselves Felicity Smoak fans. If you don’t like pregnancy or baby storylines on TV shows, that’s one thing, but to refer to Felicity as nothing more than an “incubator,” as simply a tool or mechanism from which Mia springs, is insulting to Felicity’s character and, more importantly, to all real-life mothers. Pregnancy will be a part of Felicity’s story moving forward in Season 7, but did everyone forget that she also regained full control of her company in this week’s episode and that she still serves as Overwatch on Team Arrow? Being a mother will not be Felicity’s sole character distinction just like being a father hasn’t been Oliver’s only character trait these past couple of years. These characters are more complicated and dynamic than that, and if you don’t believe that, I think we’ve been watching two very different shows over the past seven years. It’s very interesting that Mia only takes Felicity’s last name and not Oliver’s. I hope that decision will be explored more in future episodes. Arrow is off for a couple weeks. It returns with an episode titled “Brothers and Sisters” on Monday, March 4. See you all back here then. What did everyone else think about this week’s episode of Arrow? Comment below and let me know.